Rick Takahashi loves to tie and design fly patterns for the waters that he fishes. Rick has been tying flies since the age of eight years of age. 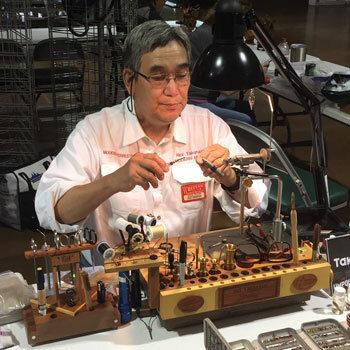 "After taking apart his first fly (Royal Coachman) and seeing the hackle unwind, I knew that I wanted to learn how to tie flies", reports Takahashi. He didn’t have the slightest idea what a fly was but knew it was for fishing because of the hook. A couple of years later, Rick’s uncle bought him his first fly tying kit and he has been tying ever since. Rick Takahashi considers midges the most important year-round foods source for trout and they are in almost every stream and lake around the world. Listen in to learn about tying and fishing midges that will work no matter where live. Rick Takahashi considers terrestrials one of the world's most effective patterns. It's a broad category of food from land-dwelling insects to mice and they are in almost every stream and lake around the world. Listen in to learn about tying and fishing terrestrials that will work no matter where you fish. Rick Takahashi is well known in the fly fishing world as a top fly tyer combining his background in color and design theory as well as on the water testing to create flies that look great and fish great. Join us to learn how Rick approaches his art form and learn his tips of the trade. He remembers seeing his first fly fisherman on the South Platte River near the town of Decker’s Colorado. He followed that fly fisherman around for a couple of hours and eventually got up the nerves to ask him what he was doing…he told him fly fishing. In fact he was using a Gray hackle Yellow. This connected the flies he so admired with the actual act of fly fishing. Rick has used his talents to bring others into the realm of fly tying. He is a demonstration fly tier often displaying his skills at local and regional venues such as the Denver Fly Show, International Sportsmen Exhibition. Federation of Fly Fisherman Conclave at a various regional fly shops near Denver. He is an illustrator and contributor to Fly Fisherman Magazine. His art has been used for the Federation of Fly Fisherman Conclave and he is working on a presentation of Midge Fly fishing for his local Trout Unlimited Chapter. Rick has written his first book "Modern Midges, Tying and Fishing the World’s Most Effective Pattern" with his fly fishing partner and co-author Jerry Hubka. Rick's goal is to share with others all of the various aspects of fly fishing and fly tying he's learned, "it’s the teacher in me that wants to share knowledge on a activity that has ment so much to me". Rick is a retired art educator and former Art Department Chairperson at Rocky Mountain High School. He teaches a fly tying course for Angler’s Roost and makes his home in Fort Collins, Colorado with his wife Susan, daughter Haley and son Josh.